My still life, especially floral, paintings get looser and looser. I have been enjoying the freedom, and the musical impression of the 2D paint distribution. I hope this flow of color does not get too sloppy. I thought I still have the balance between representational and abstract. I maybe wrong. "Demo at Ada 2017 2"
I really enjoy using dark background for my still life paintings. It is so effective to enhance the light effect at the center of focus. Still life is relatively easy to paint. However, to make a still life painting interesting is not that easy. I try all the tricks to push the envelope. My last workshop of 2017 was at Ada Oklahoma. This is my first demo. recently, I really like to combine turquoise colors with the warm red and orange colors. This is my last demo at Nashville last November. It was very enjoyable of having this delicious color play. Still life is more a design process rather than a realistic rendering. We have much more freedom than we think we have. I have painted many roses and sunflowers, and feel relatively comfortable painting them. However, I have not studied thoroughly other kinds of flowers. My general impression about carnations is a colorful whole bunch of mess. I never examined the anatomic structure of this flower. I did a close study of a pink carnation. My brush work was a little restricted and the painting looks mechanical, but is a good start. I need to do more to develop the skills. My 2018 teaching will start very soon. 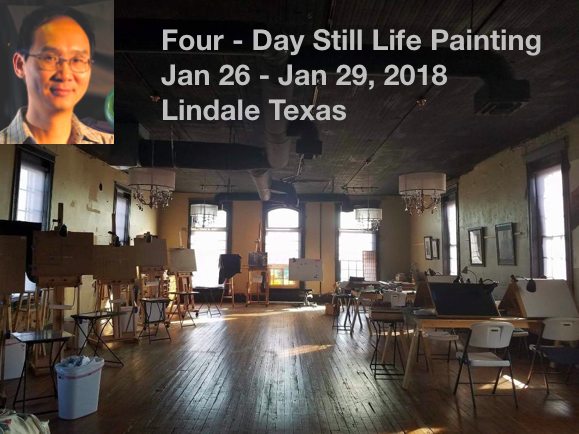 First I will teach a 3-day still life workshop at Sacramento on Jan 19 - 21, then I will teach another 4-day workshop at Lindale TX. So far I still have a few openings at Lindale. Please contact Maureen Killaby at mkillaby@suddenlink.net for information and registration. See you. January 15, 2007 was the date I posted my very first painting on my blog. Since then, I became a "daily painter" and marketed my art on the Internet. Now, 10 years have passed. I am happy I have made it so far. I am grateful for so much support I have received. I am extremely humbled for the art journey is harder than I thought ten years ago. Do I regret? I would say "maybe", I could have been a lousy engineer and provided much better "security" to myself and my family, but I will say "No". I have lived honestly with much more happiness. To celebrate my 10 yrs anniversary, I did this 6"x6" this morning. I will put in on the daily paintworks auction with a starting price of $100. This was I did ten years ago almost everyday. Somehow, I want to shut up today. Just let the painting say. I want to sincerely thank all the friends commenting and suggesting on my Venice painting I posted previously. I might do very limited amount of touches to keep the painting a Impressionistic look. Having said about painting Venice, I am excited to tell you that I am going to Italy again. I will teach and paint at the beautiful Tuscany area on May 17 - 24. I want to thank Betty Huang and Studio B Gallery for organizing. This workshop has been just added to my website. 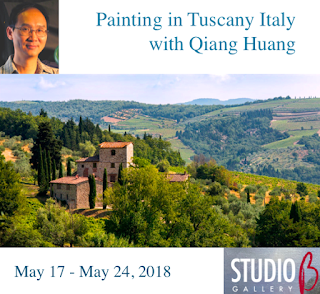 Please visit Qiang Huang Tuscany workshop for detailed info and sign up. The time I spend on a painting either very short (alla prima) or very long. I just can not do a painting in 2 to 4 days. I have shown you this painting at its early stage. Now quite a few days have passed, and the painting has reach to this point. I deliberately resist the temptation to paint more details and move toward the realism direction. I don't think it is the time to stop now, but I am rather confused about what to do for the next step. I am doing a lot of think at this moment. What do you think? I keep on posting my out of date workshop demo images. This one is what I did in Nashville TN last November. I want to thank Jeanie Smith for organizing the workshop and thanks to all the artists for attending. 2018 will be a critical and challenging year for my art. The future is mysterious. As matter of facts, the mystery is all over. I must admit that I am a control freak. I don't like uncertainties. However, the world is impermanent, My art will be a part of it. I am learning to be equanimous to everything. I should not worry too much about the winter. The spring will come, and the grasses will grow by themselves. 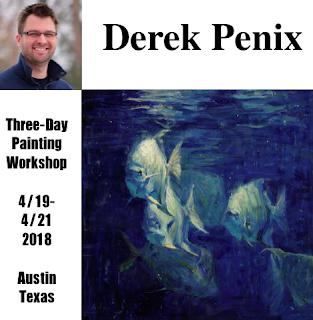 I am happy to announce that Derek Penix will come back to Austin and teach a 3-day painting workshop. The title of Derek's workshop is "Loosen UP!" His style of painting is very powerful. I met Derek a few years ago and fell in love with his work immediately. I took his workshop two years ago and have learned a lot. You probably can see some of his influence in my paintings. If you want to really energize your art, I think Derek can help you. 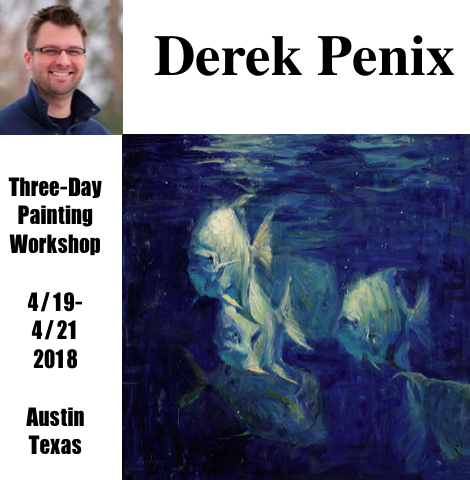 Please visit Derek Penix workshop webpage for detailed information and sign up. I haven't had enough 2017, but now 2018 has begun. I don't have a specific resolution for the new year. In general, I hope I can live my every day fully, intentionally, and sincerely. We are in an era of information, too much information I think. It may not be a good thing, just like we mix all the colors together, we get mud. We are in this information mud. We must be careful. Holiday season is over, Let's work.